Karachi (Agenzia Fides) - Accompanying Pakistani women along the path of forming an entrepreneurial mindset and starting their own small or medium-sized enterprises: this is the goal of Caritas Pakistan which in Karachi has launched the "Livelihood" project, dedicated to female entrepreneurship with the slogan "Empower Women, Empower Pakistan". The theoretical-practical training program has taught 240 women and girls in the last six months to become entrepreneurs. On the occasion of International Women's Day, on 8 March, the first 135 women successfully completed their training course, and are ready to start up their activities, especially in the textile and tailoring field. Elizabeth Patras, one of the participants in the training course, told Agenzia Fides: "I can earn about 10 thousand rupees a month by sewing clothes and together with my two daughters I participated in this special training session and we have started to work. Thanks to the support received from Caritas, I hope that our business can prosper, before we lived only 'day by day'. Now our mentality changes". Samina Maqbool, coordinator of the project on female entrepreneurship, told Fides: "The training courses we have organized for these women range in various economic and productive sectors such as candle production, craftsmanship, jewelry production, cutting and sewing, silk screen printing, clothing design and fashion". Samina Maqbool is herself an entrepreneur and manages a candle production at home. "Our program has been very successful, we have trained our women to conduct market surveys and feasibility studies. We have come to meet women's desire to start work at home. 54 girls have already started their activities while other 65 girls have found work in different factories or companies". Fr. Anthony Ibraz appreciated the tireless efforts of the Caritas team that "serves with love not only women of Christian religion, but also Hindus and Muslims", and urged women to continue this effort. Women, thanks to the proceeds of these activities, often can enrol their children at school or improve the path of their education, with a virtuous circle of human and social promotion. 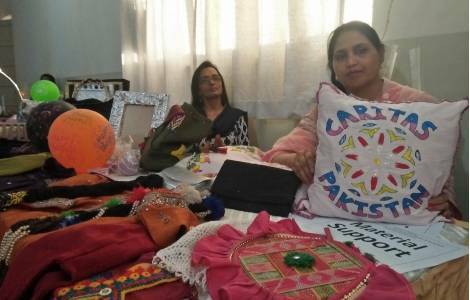 Mansha Noor, Executive Secretary of Caritas Pakistan Karachi said: "We are working to improve the lives of people who live below the poverty line, most of these women are very poor, Caritas accompanies them even after the end of their training, helping them to find work. Many company owners respect us and listen to our advice".